I was thinking more that she'd be flustered by romance, not Sokka. You know, like how kissing one guy got her so hot and bothered she spontaneously combusted and began screaming about taking over the world? Well, yeah, I see where you're going there. I thought you meant it in a way that would be unique to how she would interact with Sokka. The whole thing with Chan is probably indicative of how she might interact with any potential suitor who isn't a subordinate or her brother. I mean, that's just her way of complimenting you. I dunno but Sokka did not have the same "charm" as Chan. 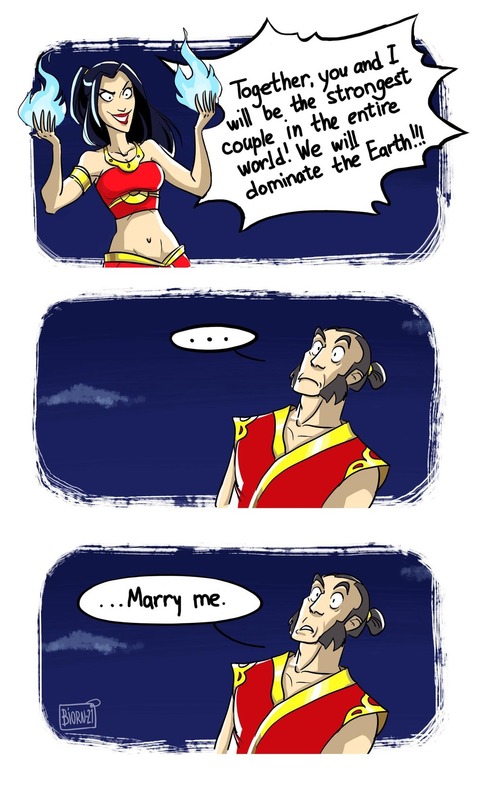 His awkwardness would most likely not trigger Azula. Chan had no charm. It was the kiss that got Azula all hot'n'unbothered, and Sokka is (canonically ) capable of kissing. In fact, Suki seemed pretty pleased on that front. Yue, too, but she only had Hahn as a comparison. Really, I see Azula's flustering coming from her not knowing the rules of romantic interaction. Everything she did with Chan was practically scripted by Ty Lee for her, and we all know that when Azula doesn't have a script, she gets unstable and/or starts bringing down civilizations. So I expect any romance for Azula that lasts beyond thirty seconds will have her flustered at times, anxious at times, paranoid at times, etc. Sokka would simply be Azula's Manic Pixie Dream Boy, albeit one with a practical engineering mindset who would also be afraid for his life. Best love story ever, if only more people would write it. I don't read all that much outside of my interests, but I've encountered enough Ty Zula to know that it is the opposite of what I just described above. I don't think that the latter would impress Azula as much as the former. I dunno, we didn't actually see Chan's charm work on Azula, did we? He went through his Beach Hunk routine, made a joke about sand that even Anakin Skywalker would have rolled his eyes at, and fell for Azula's beginner-level manipulations. Her interest seemed mainly about successfully playing the Dating Game, and Chan was simply the top dog in the field she found herself in. Sokka, at least, is smart. I think Azula would find that genuinely more attractive than standard-issue Beach Hunk charm. Provided, of course, that she ever got a chance to observe it. I 100% agree with you. My favorite couples in Avatar is Sokka & Azula, Sokka & Suki and if it is possible if Brian and mike decide to do( i. e bringing Jet back from death) so would be Jet and Azula. Now, Jet has real charm. If anyone could fluster Azula, I think he might be the one. I think so too, because both characters have a few things in common. They have some kind of flare for adventure and violence, they both will be very utilitarian about the means they use to acquire victory in their goals, complicated when coming to their friendships with others, and suffer hard tragedy. And, in a way, both built their whole lives around what they think their parents would want. I expect that trying to move past that would be terrifying in the same way for both of them. And then they will have beautiful little children and f them up even worse than either of their own parents could have imagined. Pairing Jet and Azula up would be worth it just to watch them try to out crazy one another. I once saw a joke somewhere that if you put those two together their son would turn out like Light Yagami. Come to think of it, Light would work well in a crossover pairing with either one of them to be honest. I would be interested in seeing if Azula had children or not, and with whom? If not jet which would interesting then at least sokka or some new character like Mai's previous boyfriend kei lo. At first, I was mostly a canon guy, I was satisfied with who got with who. But rewatching the series again, I ain't feeling it with Aang and Katara. I'm sure it worked better in the sequel comics, I only read The Promise and The Search and that was only through one reading and it was a while ago. I'm more on the Aang x Toph boat now, I think it's cuter and has that edge of opposites attract. I can see people not a fan and I can see why people would still prefer Kataang. I like that acronym btw, it's fun to say out loud. It's like a comic book sound effect. I still dig some canon stuff like Zuko x Mai and Sokka x Suki, though Street Fighter x Tekken, blech. Though if I gotta pair Katara with anybody, it'd be with Zuko. Heck, I might like it more than Zuko x Mai. But I'm fine with either way honestly. Let's just not get creepy and have Iroh x that one creepy eight-year-old-girl that had the hots for Aang and Charlie Brown from Kill Bill. Which Iroh you may ask? Does it matter? It's creepy either way or gross if you factor in the fact that she isn't a vampire. Sorry I had too much fun. And I also had my Adderall today. Woohoo! But, yeah that's my favorite couples. Aang and Toph I think the contrasts in their personality and lifestyle just make the idea of the couple potentially more endearing. In fact, I wouldn't say the age difference between Aang and Katara bothered me, it just felt like the two had a brother and sister bond. Again I see why people like this couple, I do see the chemistry. I don't think it made for a bad couple perse, just one I feel was underwhelming. Again, the comics might of build upon it more. I also feel the opposites attract reasoning also works with Suki and Sokka, Suki being from this strict warrior guild with organization and sternness. While Sokka had a bit of that background as well, he didn't engage in it as long as Suki so he isn't as professional (at first) and well mannered as your average Kyoshi Warrior. Especially since their most iconic member was the most strict Avatar. Zuko and Mai, it's a bit of a blue and red oni thing. Mai is the calm and relaxed goth girl (trope wise anyway) and Zuko is passionate and hot-blooded one. I liked the conflict, but my problem with it is that we didn't see much of it and was a little disappointed with how the comics handled it from what I remembered. But as for why I like Zuko and Katara since we do get that nice bit of drama and trust, their lifestyles contrast more as well as their personalities. They both do have that hot-blood, sternness, and maturity but they're still are very different and could make for a nice couple as a whole. I'll be honest I don't have the most experience with romance. So I don't blame y'all for thinking my reasonings are as graceful and stable as dynamite with lipstick with an avalanche approaching the detonator. Oh, and the buildings are made of styrofoam. Just wanted to add that last bit. I truly do think Aang and Toph might have felt a little something something up until 'The Desert.' I think the whole Appa Incident killed what was building there. But it came so close, and they still do more synchronized Earthbending than Kataang did synchronized Waterbending. DanChaolan what do you think would be a good paring with Azula? A relationship between Katara and Zuko in a romantic light is better written then Anag, but from what i remember originally Zuko was going to be dating Katara. I agree. It's very satisfying to see Aang really get in tune with Earthbending. I did like the synchronizing between Aang and Katara though, it added some nice conflict and growth with Katara, having her sync with Aang feeling satisfying as well. I honestly don't know. I guess if we age up Azula, maybe Zhao (or heck, age him down). They're both sinister and passionate to the Fire Nation. though Zhao is a bit more level-headed. He can be a bit aggressive, but it ain't in the same league as Azula's aggression. Outside of that, I can't think of anyone else without modifying the age or anything. Also, what is Anag? Is that Aang x Azula? DanChaolan what do you think would be a good paring with Azula? I'm not into shipping myself, but I do enjoy seeing fanart of certain pairings from time to time, i.e., the ones that I find amusing, like the one above. Also, I'd be lying if I said I haven't seen my fair share of steamy Zukaang art. We don't know the legal age of adulthood in the Fire Nation. It's 16 in the Water Tribes, evidenced by Yue's birthday, so I figure the Fire Nation has to have that at a minimum. More technologically sophisticated societies (AKA less agrarian) tend to have higher ages of adulthood, but at the same time, the Fire Nation was at war with a country much bigger than itself, so they probably needed troops and resisted raising the age of adulthood. So 16 is a fair guess for them, too. That puts Azula, at 14, as legally too young to marry Zhao. Once she hits 16, it would be gross, but if it's what she wants I'm not going to get myself lit on fire trying to dissuade her. So, is it safe to say with absolute confidence that Zuko and Suki are having a hot and steamy affair? I read a sadly unfinished fic with Suzuki in it, and Sokkla. Azula is allowed back into the palace but is in such a deeply depressed state that she only paints and never speaks to anyone. Sokka however is so impressed by her painting skills that he wants to learn from her. His relationship with Suki is meanwhile going downhill but he still doesn't know or notice the makeout sessions happening behind his back. I prefer to keep Suzuki in AU's. That leaves Sokka free for Maikka without the whole thing getting super-weird. One of these days I need to get back to developing the plot for the Suki-as-Zuko's-Much-More-Savvy-Than-Him-Bodyguard AU. I wrote a series of shorts for it that were meant to be a collection of vignettes but just became a weirdly disjointed continuous story, and even if I don't ever write a better version, I at least want to work out a proper story arc for it. Zuko is captured by the Kyoshi Warriors after his initial assault on the island, and they keep him there in order to protect Aang. Prisoner/Captor romance ensues! Suki encounters Zuko at the Ba Sing Se ferry while working as a guard. Shenanigans and eventually romance ensue, especially when Iroh steps in to save his nephew's life. Kyoshi makes a ghostly appearance and declares that Zuko is the key to ending the war with the Fire Nation, but that's a problem because his sister is on the path to killing him. Suki undertakes a holy mission to keep Zuko alive and maybe ask him nicely if he's ready to convert to the side of good, yet? Shenanigans and seduction ensue! Suki turns out to be the daughter of Azulon's illegitimate daughter. So Zuko is her second-cousin... and her only path (via marriage) to regaining her royal status! Seduction ensues! Suki is Bumi's long-lost great-granddaughter, and Omashu is in debt. Bumi wonders if Zuko is in need of a highly capable royal wife who he'd be willing to pay a great dowry for? Outrage (and eventual romance) ensue! I admit, I like comedy. But I really need to come up with some action-adventure AU's for these two. I support the fanfic framing Suki as Zuko's much savvier bodyguard. I would read that in a heartbeat. Please just post the weirdly disjointed vignettes so I can get my fix of this premise. One of these days I need to get back to developing the plot for the Suki-as-Zuko's-Much-More-Savvy-Than-Him-Bodyguard AU. Here is another idea: Suki was adopted into the Royal Family when she was just a baby and grew up alongside the siblings. She is now accompanying Zuko on his quest to find the Avatar because she rather spends time with him than with Azula. Plot twist: Suki is still the leader of the Kyoshi Warriors, and from 103, the KWs become Zuko's very own Elite Mooks (you gotta admit, they complement his Blue Spirit persona very well). Was this widely discussed in the fandom? Was it ever resolved in the comics? I only wish there would be something - anything - Suki related widely discussed in the fandom . But yeah, Suzuki is as close to it as it can get.